The Rear Column tells the story of five soldiers stranded in the jungle of the Congo Free State in 1887. 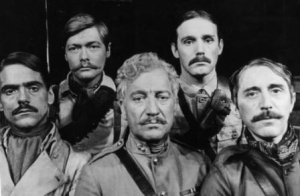 They are awaiting the return of the explorer, Henry Morgan Stanley, who has gone to relieve Emin Pasha, General Gordon’s last surviving lieutenant in the Sudan. As food and medicines run out, and the porters become restless, the endurance and sanity of the whole group, and their relationships with one another, are sorely tested. 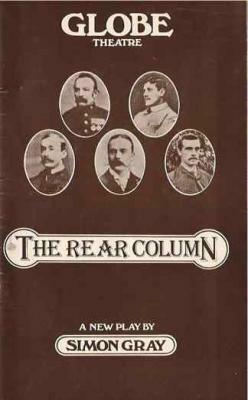 The Rear Column was presented by Michael Codron on 22nd February 1978 at the Globe Theatre, London. A. S. Byatt, The Times Literary Supplement, 25 April 1980. 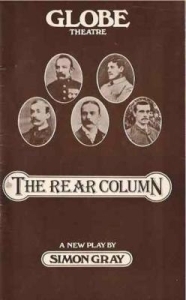 The Rear Column is now available as a Faber Contemporary Classic in Simon Gray: Plays 3. To order a copy on special offer at 25% discount please contact Faber using code GRAYPLAYS. Or check out the plays section of our bookshop.